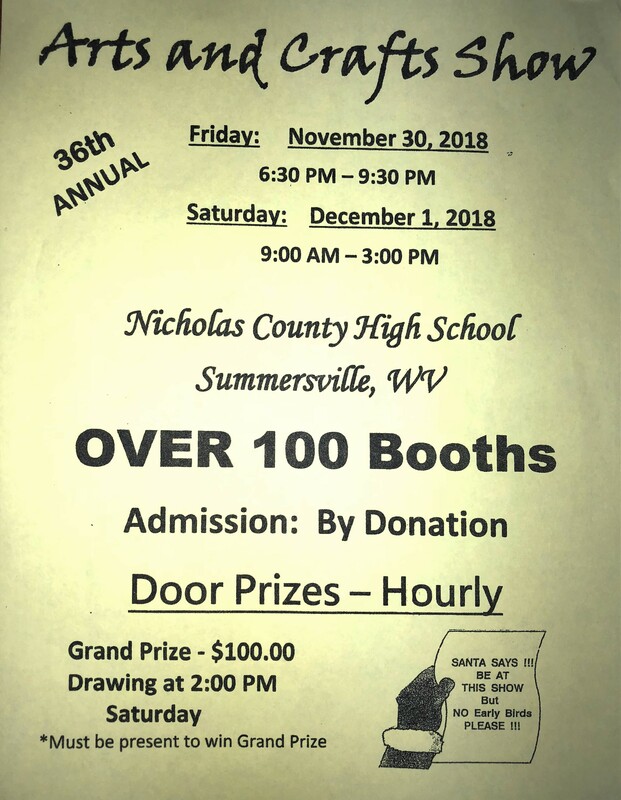 On Friday, November 30, 2018 from 6:30 pm to 9:30 pm and Saturday, December 1, 2018 from 9:00 am to 3:00 pm, Nicholas County High School will be hosting the 36th annual Arts & Crafts Show in the NCHS commons area. Donations will be accepted as admissions, so any amount of money will be taken up to pass as admissions. It is accepted that there are no early birds when customers come. The vendors are supplied a select amount of time to prepare and may not be ready if you are early. Mrs. Barker, the event coordinator, said “There will be door prizes hourly.” In order to qualify, you must fill out a piece of paper supplied by an event staff. There will also be a Grand Prize which will be $100. You must complete the same process for the Grand Prize as the regular door prizes. The Grand Prize drawing will be held on Saturday at 2:00 pm. The winner must be present. The National Honor Society students and student volunteers will operate the doors and concessions, while Mrs. Barker coordinates the rest of the Arts and Crafts Show.